these McCurdy horses for sale. Check back often to see more pictures. Maddie is a nice filly out of “Ulrich’s Lucky Star McCurdy” and “McCurdy’s Ragin Cajun”. She is halter broke but hasn’t been broke to ride but she is the right age to start. Maddie is Chocolate Bay turning grey. Should mature at 14.2-14.3 hands. Gaits at liberty in pasture. More horses to be added soon! Should mature at 15 hands. Ghost is a gorgeous steel grey McCurdy Gelding. 15 hands with good bone. Ghost is calm, gentle and naturally gaited. He is very athletic and will be very versatile under saddle….he is going to make someone a wonderful horse. Should mature at 16 hands. 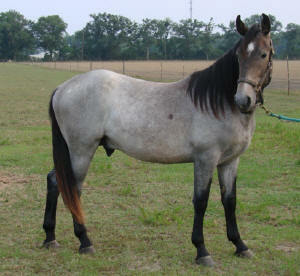 Ladybird is a 15.3 hand, big boned dapple grey mare. She is out a old line of Lowndes Co. McCurdys. Ladybirdy is naturally gaited and is very calm under saddle and in hand. She is a half sister to our stallion, McCurdy’s Masterpiece. 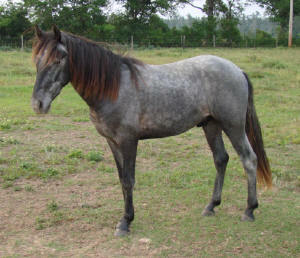 Blue is a beautiful dapple grey McCurdy Gelding. He is a 4.5 year old, 15 hands and calm and willing. Blue has a very nice natural gait, is very intelligent and is going to be a tremendous luxury trail/endurance gelding. He is currently finishing up his training and will be ready to go as a finished trail horse at the end of December. A very well built, muscular Colt out of our mare McCurdy’s Miss Blue & Ragin’ Cajun. 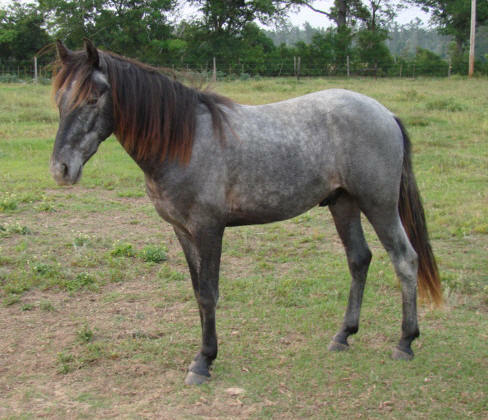 Looks red roan but will grey with time. Gaits at liberty in the pasture. Will mature between 15.1 & 16 hands. Very nice gelding prospect. Caesar is an exceptional big bodied, big boned, heavily muscled colt. Caesar is calm & laid back, like both of his parents. Sired by Ragin' Cajun, and out of Destiny's Diamond Rio, his linage goes back to Big Red on the bottom side and McCurdy's Rooster and Roy's Cowboy on the topside, all Foundation stallions. Lucky is Blue Roan out of “Ulrich’s Lucky Star McCurdy” and sired by “McCurdy’s Iron Little Man"
He is refined and beautiful. Gaits at liberty in pasture. 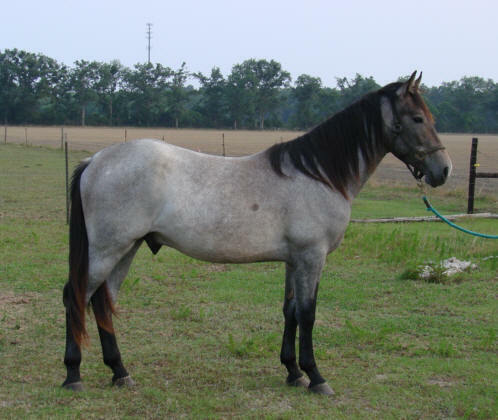 This Red Roan mare is very well built and refined. She is very gentle in hand and under saddle. Ruby has the classic McCurdy gait and is very willing. Ruby is in foal for 2007 to McCurdy’s Ragin’ Cajun. He is 3 years old and very calm. He is THE smoothest riding horse that I have ever ridden and also one of the most settled that I have seen. He is the horse of a lifetime.